I made a pizza box solar oven at the weekend. 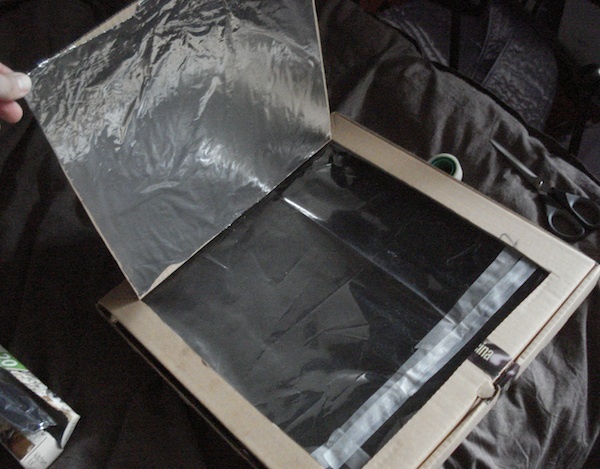 I've been meaning to make a solar oven for a while, but this one struck my fancy because I had everything I needed already (including an old pizza box). I used an A4 plastic document wallet (cut open and retaped to fit the hole I'd cut) for the film, and some black card (again, cut and retaped) for the bottom. I tried it out with biscuits yesterday, and unfortunately wasn't all that impressed. I'm not convinced that the box itself seals particularly well (so the hot air is escaping), and even allowing for half an hour to heat up, the biscuits were only halfway cooked an hour or so after I put them out. They did definitely warm up quite a lot; but not to anything like the temperatures suggested in the instructions linked above. This may be to do with the UK climate, but my south-facing balcony catches the sun pretty well, so I'm loathe to give up entirely. Instead I intend to try this option, as soon as I've collected the necessary kit and have some free time.